Very nice coat. My son loves it. 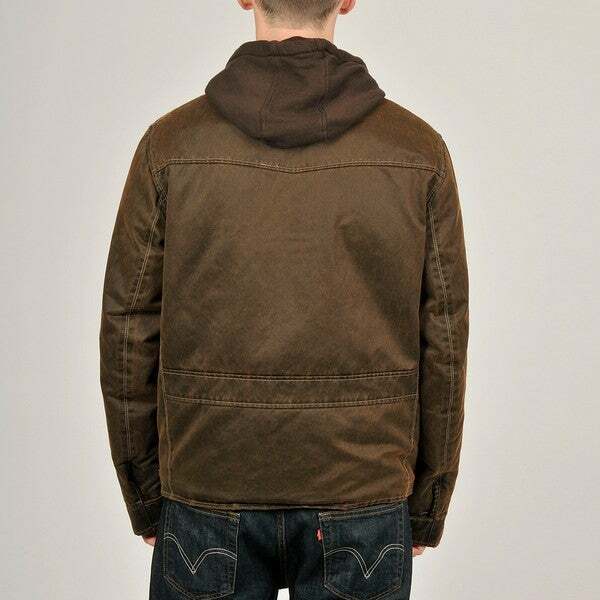 A detachable hood lends added style and warmth to thisgarment-washed hooded jacket from R&O. Constructed of100-percent cotton, this filled jacket is finished with a zip-frontand button placket. The approximate length from the top center back to the hem is 27inches. The measurement was taken from a size medium. Bought jacket for my husband. He really likes it. Fit is true to size. He wears a 2x. Quality product and a very good looking jacket. I would recommend this jacket. GREAT jacket. Love the color. Comfortable. Looks just like the pictures. Perfect fit. I'm 5'11", 200lbs. The XL fits me like a glove. Not baggy. Snug, but not tight. Large would have been way too small on me for sure. I chose this product because, as with most Americans, I was looking for something else and couldn't find it I have a valid credit card and I'll be damned if I'm not going to use it. I feel that as an American, I have a responsibility to be in some kind of debt because we have a representative government. In order for my government to represent me I, too, must be in debt otherwise my government looks bad. I'm doing my part as a patriot and a good citizen. Plus, this looks like a pretty cool product, even though I own more than enough clothing. God bless America and our system of commerce! I had a 3 in 1 jacket like it, but by another manufacturer. I loved the jacket and when it wore out I wanted another one like it. The other manufacturer has discontinued the product so I searched everywhere until I found another jacket like it.